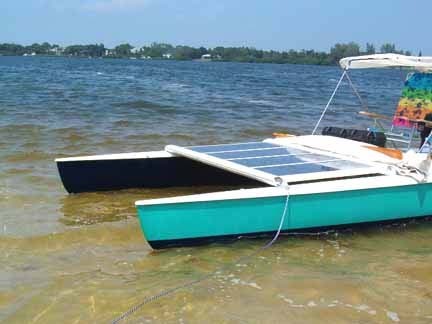 I built this boat several years ago from a Sol-Cat catamaran sailboat to test various combinations of solar photovoltaic recharging, batteries and electric trolling motors. The photos were taken on September 4th, 2005 in Palma Sola Bay, Bradenton, Florida. 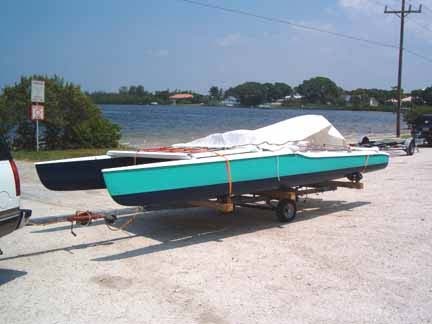 The boat is 18' long with a 7' beam and draws about 8". 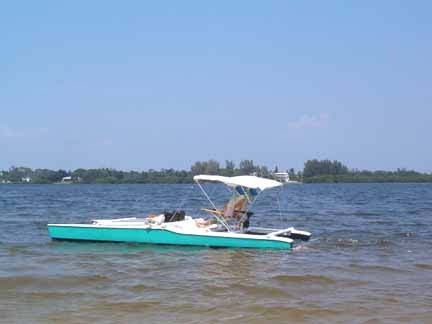 It is powered by an electric trolling motor (not included) and two deep cycle 12 volt batteries (also not included). 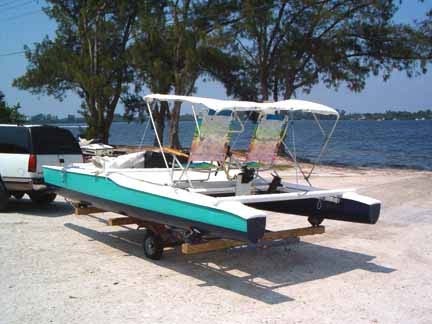 Battery boxes and the motor mount are included and the boat is ready to use after adding your own trolling motor and batteries. The boat is equipped with four, 30 watt photovoltaic solar panels mounted on the foredeck. They are wired (with Anchor Marine tinned stranded wire) in parallel (with blocking diodes on each panel), and connected to two batteries that are installed in new heavy duty plastic battery boxes. (Again, batteries not included). The boxes are large enough for large size deep cycle batteries. 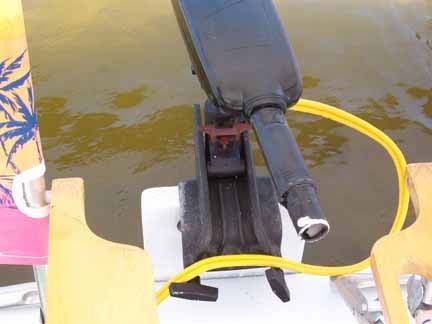 The electrical power from the batteries is then run to the back of the boat through 6 gauge stranded copper wire, to the Attwood trolling motor connector. 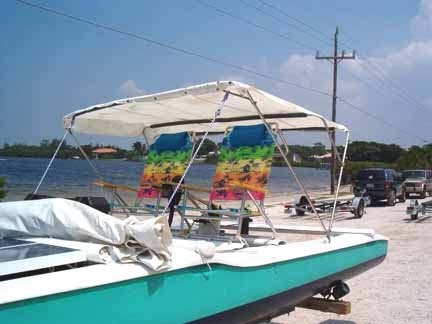 Two colorful beach chairs are attached to the cross framing which fold down for trailering. 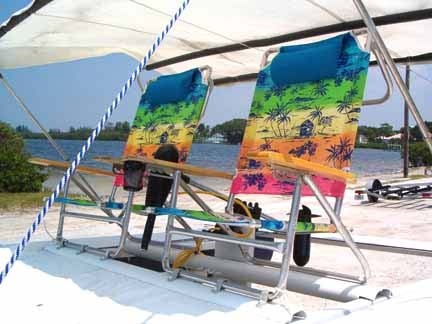 The beach chair backs can be folded flat so they can be used for sunbathing or adjusted to suit your comfort while cruising. 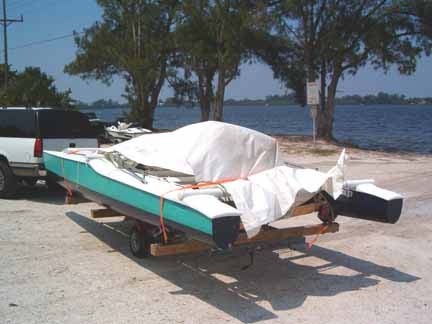 The bimini top folds down for trailering or sunny cruising and the entire battery box, seat, bimini top, motor area is covered by a dacron sailcloth sheet for trailering protection. Not shown is a small sail rig that I had planned on installing on a tabernacle just in front of the battery boxes. I will include this single sail, mast, tabernacle with the boat with some advice on how to install it. 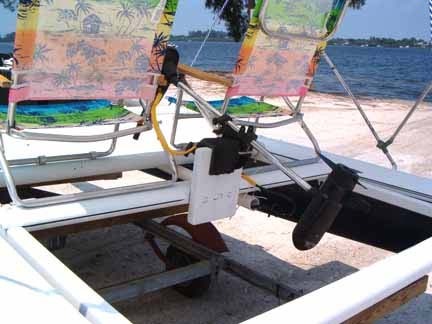 The purpose of the sail rig was to allow the boat to be sailed (slowly with the smaller dinghy type mast/sail) when cruising instead of using the electric trolling motor. The aluminum mast is small enough to be carried on board, ready for raising when needed. I have filled in one of the centerboard slots so that only one centerboard would be used (positioned next to the skipper on the starboard hull) when sailing. 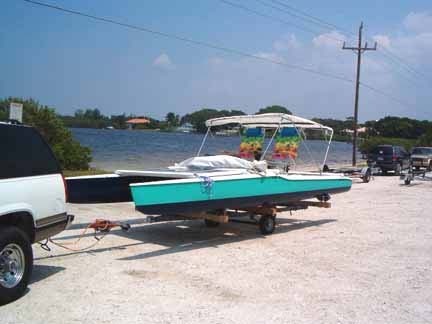 I also have the original twin rudders and cross bars to use it as a sailboat, but are not needed when the electric trolling motor is being used. 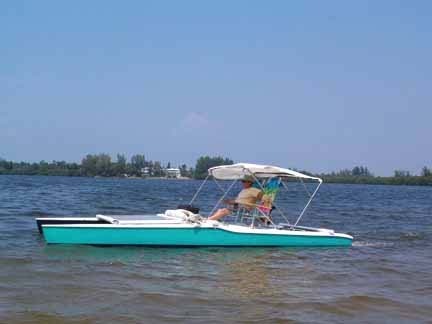 This boat is perfect for lakes, ponds and any other area where the waters are fairly calm and especially where gas powered boats are not allowed such as reservoirs. 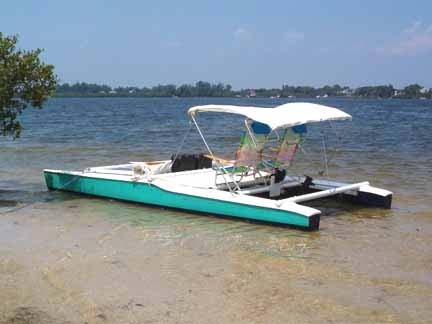 It should not be used in open water where there is a strong current, wind or wave action due to the bimini top and low freeboard. 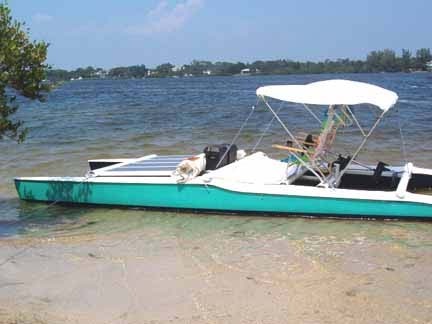 It would make a great fishing or exploring boat and could also be equipped with a small gas outboard if needed (but this defeats the purpose of the quiet aspects of electric cruising). 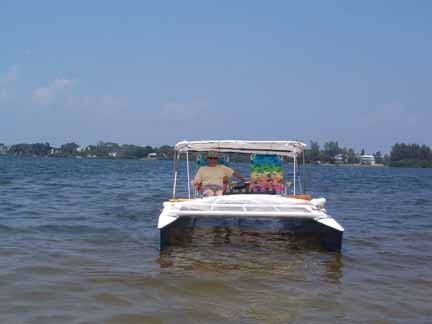 The boat moves along quite well with an electric trolling motor as shown in the photos. 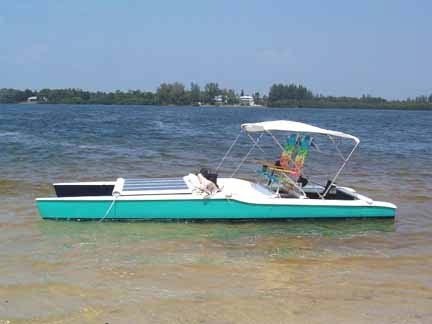 The solar panels help to recharge the batteries while you are cruising but are not capable of directly powering the trolling motor. They are perfect for recharging the batteries between weekly cruises, depending on how much power you have drained from the batteries (and available sunlight). A standard battery charger could be used to recharge the batteries if needed. 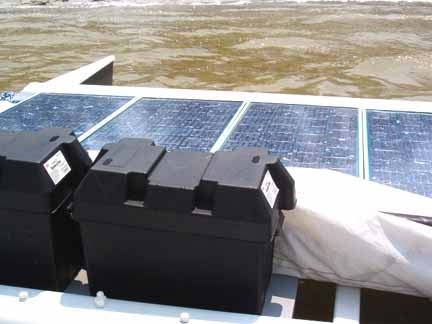 The solar panels and large battery bank could also be used to power your 12 volt needs at a camping site. 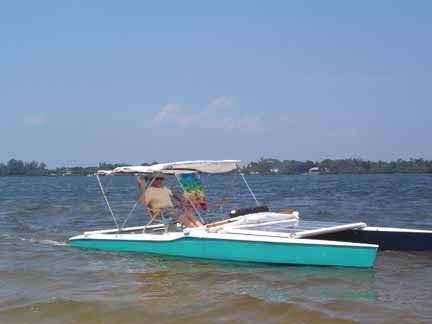 We have been using a MotorGuide 12 volt, 52 pound thrust electric trolling motor on this boat with great success. Since there is space for two 12 volt batteries, you can use either a 12 volt or 24 volt motor (the solar panels would need to be reformated for 24 volt).